Over 250 Tool Reviews per Year—Learn from the Pros! Join over 30,000 Pros who receive our newsletter twice each week! Our tool reviews newsletter is literally packed with product reviews, tool shootouts, and new product announcements. We don’t try to sell you anything, and it’s a great way to stay up-to-date on what’s new from your favorite tool manufacturers and brands. Special announcements for Pro Tool Reviews insiders! Sign Up for the Tool Reviews Newsletter Today! Get the industry’s most informative newsletter twice a week—and we’ll never spam you or sell your info. The Pro Tool Reviews tool newsletter goes out twice each week and features our latest tool reviews to give you a hands-on feel for the newest tools from manufactures. 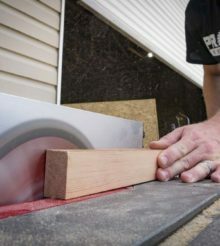 Whether it’s the latest cordless tool, a new saw, or something that fits in the hand, our weekly tool newsletter covers. We get Pro perspectives from the tradesmen who use these tools every day and get you feedback on what you need to buy. Of course, the tool newsletter also highlights the latest giveaway, so you get a reminder to enter and win. No matter what your level of expertise or trade, the PTR newsletter makes for an interesting read.